It is now meteorological autumn but as I wander around the nursery and garden, I still see some lovely plants that will give a final burst of colour before we rely solely on the autumn colours. Blasts of yellow, orange, red and burgundy to name a few. Some of these plants have been in flower for a month or two now but will keep on until the first frosts. The garden at The Place for Plants is well known for its spring colour from Rhododendrons to Camellias and Magnolias. However over the past few years we have been planting a more varied selection of plants to increase colour for summer. Some of those include Hydrangeas, Roses and Clematis. This months blog will look at these and other plants to consider for extending that late summer colour. 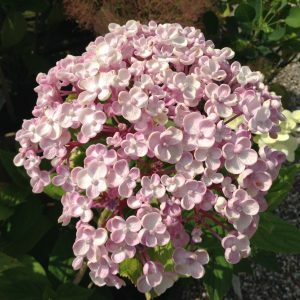 Hydrangea macrophylla ‘Ayesha’– my favourite Hydrangea of them all with its lilac flowers which have a slightly upturned raised edge to each petal. On acid soil (like in the garden at The Place for Plants) it is the most beautiful blue with a slightly washed out centre. However on chalky soils it turns the a delicate pink often with a blue eye (as seen in the picture below). H. ‘Ayesha’ has quite showy blooms and is a good plant for semi-shade. Any soil is fine as long as there is some moisture retention. It makes quite a large plant growing up to 1.8m (6ft) tall. 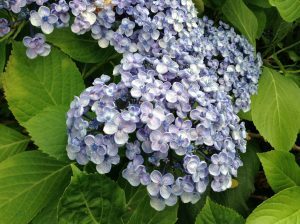 Like all hydrangeas you can grow it in a pot which will restrict its growth. This makes it much more manageable for all gardens, as long as they have some shade. If you don’t have acid soil then planting it in a pot with a mixture of ericaceous compost and John Innes Number 3 will give you the blue flowers you want. Euonymus alatus– one of the ‘American spindles’ that is part of the National Collection that we have here in The Place for Plants garden. This plant is ideal for the smaller garden and is great for a slightly more exposed position which will encourage it to turn into its brilliant reds and burgundies when the weather starts to cool at night. E. alatus start to turn at this time of the year and will be in colour for a month or so. These are often the precursor to the glories of the other plants that make autumn so spectacular. It likes a good soil which is well drained. Euonymus bungeanus ‘Dart’s Pride’– Another member of the National Collection although E. ‘Dart’s Pride’ is taller than E.alatus. 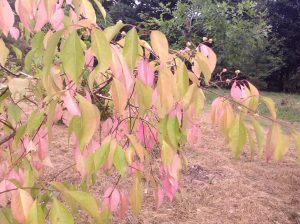 This plant has the most beautiful autumn colour, turning with translucent yellows and pinks. The fruits are creamy-green in colour and almost insignificant compared to the autumn colour. 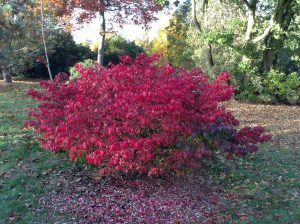 It is a difficult plant to obtain so I like to wander around the garden at this time of the year to watch it change over the coming month. Clematis ‘Bill Mackenzie’– A lovely species climber that produces thick lemon-peel like flowers throughout the autumn right through until the first frosts. 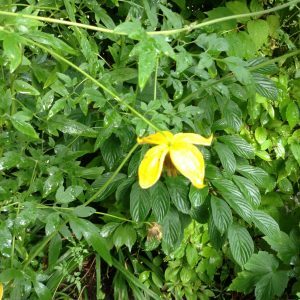 It is a vigorous plant climbing up to 6m (20ft) in height and is ideal for a slightly exposed position. Clematis ‘Bill Mackenzie’ will grow in any soil as long as it is moist and fertile. It combines well with rambling roses and looks great when grown through larger specimen shrubs such as conifers or hollies. 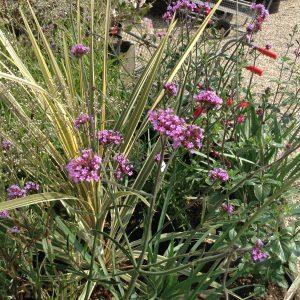 Verbena bonariensis– A stalwart of the herbaceous and mixed border! Verbena bonariensis is a must for any gardener who wants colour for about 6 months of the year; it just goes on and on. The beautiful open airy habit allows it to be placed in the front or the back of a border and the delicate pale mauve flowers combine nicely with many other plants. Verbena bonariensis likes a warm sunny spot that is free draining and will seed itself everywhere if allowed to. Although I find that it does not like to grow in disturbed soil as this often prevents the seedlings getting established. The great autumn clean up – this will be an on-going job for the next month or three as autumn approaches. Now is an ideal time to make a leaf mould clamp. First, find an area of the garden where it can be placed and simply knock four posts into the ground. Then put some chicken wire around these to make a fenced in area. Any leaves that you rake up can then be placed in here and in a year or two’s time they will have made the wonder stuff that is leaf mould. This black gold, as organic gardeners often call it, is ideal for adding structure to your soil. Use it as a mulch around woodland plants and this will increase the water holding capacity of your soil and its micro-organism activity as well as improving the structure.